For Lascaux in the Corrèze depairtment, see Lascaux, Corrèze. Lascaux is the settin o a complex o coves in southwastren Fraunce kent for its auncient cove pentins. The oreeginal coves is locatit near the clachan o Montignac, in the Dordogne département. Thay conteen some o the maist weel-kent Upper Paleolithic airt. Thir pentins is jaloused tae be 16,000 year auld. Thay maistly conseest o realistic eemages o muckle ainimals, the maist o thaim is kent fae fossil evidents tae hae bid in the airt at the time. 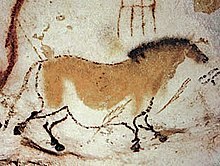 In 1979, Lascaux wis eikit tae the UNESCO Warld Heritage Steids list alang wi ither prehistoric steids in the Vézère valley. Wikimedia Commons haes media relatit tae Lascaux. This page wis last eeditit on 20 Julie 2016, at 01:16.